Garden Roses have a very limited season and are some of the most beautiful forms in the botanical world. They are exquisite in color and design. 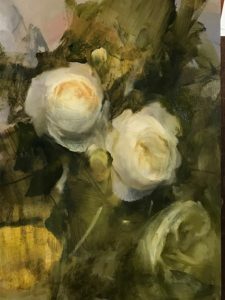 This workshop will cover a basic introduction to painting this challenging subject. Kathleen will demonstrate the indirect method she uses to translate their subtleties. Drawing, color, and paint handling will be addressed in detail. Painting experience is recommended as this is advanced subject matter.